LCA Alumni Nic Snowden doing great things both on and off the field at KSU! Way to go Nic. 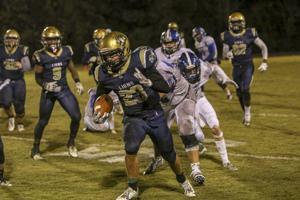 Cameron Lifsey breaks off a big run against Trinity Christian Friday night. LOGANVILLE — Loganville Christian Academy’s goal of pursuing a state championship in football came up one point short in the first round of playoffs as they fell short to Trinity Christian (Dublin) 7-6 here Friday. LCA (4-8) trailed the entire game after Trinity scored late in the first quarter. The Lions’ only score came on a 66-yard pass from Cam Anderson to Jordan Jackson. A missed snap/hold kept the Lions from tying the score at the end of the second quarter. Anderson was 7 for 19 and 149 yards. Jackson caught four passes for 122 yards.